Created as a communication tool for CFR Agents, Brokers, and Staff. Thank you to the Agents, Vendors, and Associates that have helped with the New Agent Recruiting. We have added several new REALTORS® to the CFR roster in October. Again, THANK YOU for all your efforts. There are three fax lines coming in to the Corporate Office. Your primary fax number is 602-296-7768. 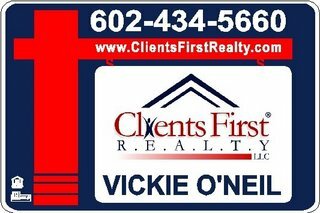 The secondary administrative fax is 602-358-7851 and there is a direct fax to the Broker at 602-374-2792. Please use the primary fax whenever you are sending paperwork to the office and this is also the fax number we want given out to vendors and associates. The additional fax line information is for CFR Agents, Brokers and Staff. The primary fax is designed to handle up to six incoming faxes at a time and also has twelve hours of memory storage, but just in case of paper jams, out of paper, out of toner, etc., you will have the additional numbers to use. We hope you find this information helpful. All of your Local, State and National Associations of REALTORS® are pleased to announce the arrival of REALTOR® Designation Awareness Month. NAR has established November as a month in which to encourage its members to "Keep it in the Family" by starting, completing, or continuing an official NAR-endorsed designation program through NAR or one of its affiliates. NAR and its nine Institutes, Societies, and Councils offer twenty advanced education designation and certification programs to help members remain up-to-date in the dynamic environment of Real Estate. The National Association of REALTORS® and the Glendale Board of REALTORS® strongly encourage its members to increase their professional image, marketability, productivity, and income through the pursuance of a designation or certification program. 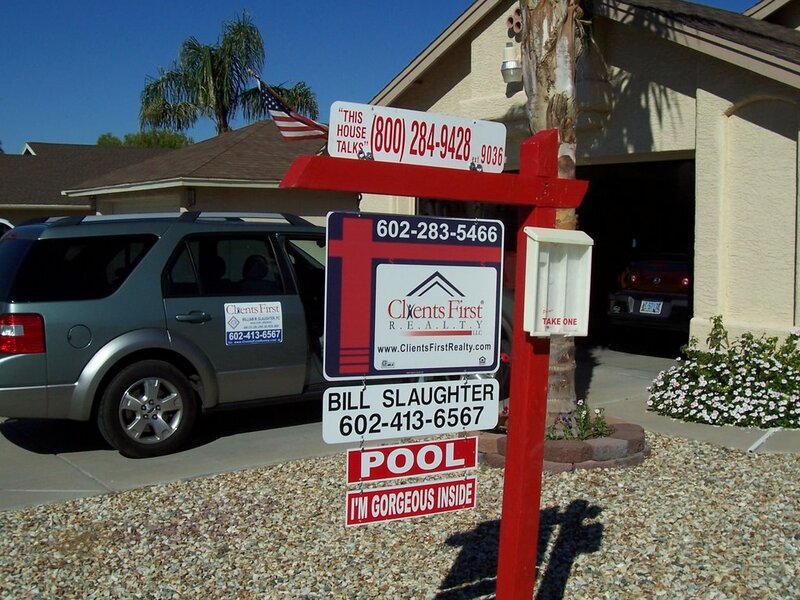 Whenever you have a listing and have set up a yard sign, it is your responsibility to remove the signage once the listing has reached the Close of Escrow, expired or has been cancelled. The accepted industry timeline is 48 hours. Remember, Courtesy is Contagious. NEW SIGN - CONGRATULATION - WELCOME ABOARD !!! The new CFR house sign attached to a 'red post' stands out from way down the street. Great way to bring attention to your listings. It won't take to long before the 'red post' branding will become synonymous with Clients First Realty. We all should congratulate Mr. Navarro. 90 days in the business over $30,000 in commissions RECEIVED. This is during a slow market. Please don't tell Felipe. Like to WELCOME Laura Ohmer from High Profile, Edward Olson from Westford College of Real Estate and Tim Riordan from Century 21. Some of the students we have talked too had some problems with the test. Don't give up. Test isn't easy for everyone but it can be passed if you study hard. The first orders placed for the car magnets should come in today or Monday. Remember if you want a set, the Company is paying half. Both Chicago Title and Magnus Title are offering classes. Please take advantage of them when you can. Some qualify for CE hours. Remember, you need 24 hours every two years to maintain your licenses. You have certain mandatory categories that must be satisfied in your 24 CE hours. Please don't wait until the last minute to renew your licenses. Do you want to qualify for your CBR (Certified Buyers Representative)designation? Westford College is holding a three day course, Oct 30th, 31st and Nov 1st. 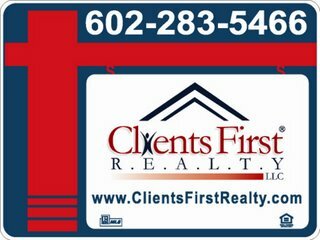 Clients First Realty is going to start a session every Wednesday from 5 to 7 called "Ask The Broker". Just show up with your questions or areas you need some coaching with. We will try to address all legitimate topics that you want to learn about. Clients First Realty is proud of our REALTORS and Staff. We want to show you off on the Corporate Website. Please send us your BIO and PICTURE to display. Thank you to the Agents who have already sent theirs in!!! NEW CAR MAGNETS AVAILABLE NOW !!! You can order 12 X 18 car magnets with your name and phone # on them. They are manufactured through Realty Signs. The cost on each set of signs is currently $110 + Tax. If you decide you want a set, just contact the office and we will order them for you. As an incentive to everyone, the Company will split the cost of these advertising magnets. Your cost will then be $55 + Tax and will be billed to your quarterly statement. This is an attempt to clarify the Company's position on what is commonly referred to as "the termite report". Clients First Realty, LLC does not place the wood infestation report as a mandatory item for our Agents, but we HIGHLY recommend that it is done on each and every transaction. According to AAR's Resale Purchase Contract 5/05, page 5, paragraph 6c, lines 198-202 the following will be found. "Wood-Destroying Organism or Insect Inspection: IF CURRENT OR PAST WOOD-DESTROYING ORGANISMS OR INSECTS (SUCH AS TERMITES) ARE A MATERIAL MATTER TO THE BUYER, THESE ISSUES MUST BE INVESTIGATED DURING THE INSPECTION PERIOD. The Buyer shall order and pay for all wood-destroying organism or insect inspections performed during the Inspection Period. If the lender requires an updated Wood-Destroying Organism or Insect Inspection Report prior to COE, it will be performed at Buyer's expense." Seller agrees that, based on termite report, seller will correct all issues and procure a clear termite report acceptable to lender and treat the entire home for termites or treat as per warranty, if any. I hope this answers the questions that several Agents had concerning this item. A NEW LOOK IS COMING ! ! ! Just letting you know what's going on with your Company. We are presently redoing the YARD SIGNS, so to create a stronger, more recognizable branding. Should have the first few within the next couple of weeks. Hopefully, if it works like we think it will, the RED POST will create the positive branding we are searching for with our listing signs. Just a reminder, if you have changed addresses since joining CFR, please update our files with an email or fax. Arizona Department of Real Estate requires you change your records online within 10 days of the move. If you need help doing this, just give us a call and we will walk you through the process. FYI reminder... Take advantage of the Chicago Title Classes, if you have time... They are free and informative. The instructors are great and they always have cookies. The New Transaction Tracking System is working great. This is a quick and easy way to keep you up to date on your transactions. If you have any concerns or questions about the system give me or Vickie a call. If you see a way it could be better, please make us aware of it. If the change is possible and benefits everyone, we will attempt to implement it.